Avalon VT-737SP Mic Pre/EQ/Compressor Channel Strip. Please message us immediately if you wish to remove the signature requirement from your order. Now includes the Baby Face and Blue LED Mods. The Avalon VT-737SP features a combination of TUBE preamplifiers, opto-compressor, sweep equalizer, output level and VU metering in a 2U space. The VT-737SP has three input selections: 1. The VT-737SP features a higher-performance microphone input transformer with +48v phantom selection. Instrument DI high source input with jack located on front panel. Balanced line input, discrete high-level Class A. A high gain switch boosts the overall gain of the preamplifier. The four high quality tubes are configured as singled ended anode coupled followers. A passive-variable high pass filter and hard-wire relay bypass completes the input signal conditioning. The phase reverse relay is available on all three inputs. The opto-compressor features a minimum signal path design with twin Class A vacuum tube triodes for gain matching. The optical attenuator acts as a simple passive level controller. Full dynamic control from soft compression to hard- knee limiting can be achieved with threshold, ratio-compression, attack and release controls plus gain reduction selection on the large VU meter. Special spectral control including de-ess is available with the dual sweep mid EQ to side-chain switch. The VT-737SP equalizer utilizes 100% discrete, Class A-high-voltage transistors for optimum sonic performance. The high and low frequency bands provide the smooth characteristics of an all passive design, while the dual mid bands include variable frequency and switched Q-width selection. The enhanced range of the mid bands is extended into the high and low bands by the use of X10 frequency multipliers. The bypass switch incorporates a sealed silver relay for the most direct signal path. When the EQ to sidechain is engaged, the high-low EQ remains in the audio path for "tone enhancement". The output level control provides a variable control of the overall signal path. The output amplifier utilizes another dual triode vacuum tube driving a 100% discrete, Class A, high-current, balanced and DC coupled low noise output amplifier. Vacuum tube triode signal path, transformer balanced microphone input, high-voltage circuits for maximum headroom to +30dB, low noise -92dB, internal discrete power supply with toroidal transformer, soft-start tube life extender, stereo link for compressors, all discrete Class A equalizer with musical passive filter design, sealed silver relays for signal routing, large control knobs with professional conductive plastic potentiometers, VU meter for output level monitoring and compressor gain reduction. Circuit topology: Four dual triode vacuum tubes (Sovtek 6922), high-voltage discrete Class A. Gain Range Microphone: Transformer balanced 850/2500 ohm, 0dB to +58dB Instrument: Unbalanced 1 meg ohm, 0dB to+30dB Line: Balanced Class A 20k ohms, -27dB to 28dB. Maximum output level: +30dB balanced 600 ohms, DC coupled, discrete Class A. Output type and gain: XLR connector, output trim gain -45dB to20dB. Noise microphone EIN: -116dB, 22Hz to 22kHz unweighted. Distortion THD, IMD: 0.5%. Frequency response -/2.5dB: 10Hz to 120kHz input filter included. Frequency response -3dB: 1Hz to 200kHz line in-out. VU meter and gain reduction: High quality illuminated OVU =+4dB and gain reduction to -20dB. High cut filter Variable 6dB per octave 30Hz to 140Hz. Compressor type: Optical passive attenuator incorporating twin vacuum tubes and stereo link. Threshold - Ratio: Threshold variable -30dB to +20dB, ratio-compression variable 1:1 to 20:1. Attack - Release: Attack variable 2mS to 200mS, release variable 100mS to 5 seconds. Equalizer type: Discrete Class A, variable active and switched passive design. Switched 10kHz, 15kHz, 20kHz, 32kHz, +/- 20dB range. Variable 200Hz to 2k8Hz and 2kHz to 28kHz, +/- 16dB range. Variable 30Hz to 450Hz and 300Hz to 4k5Hz, +/- 16dB range. Switched 15Hz, 30Hz, 60Hz, 150Hz, +/- 24dB range, shelf. AC power: Internal toroidal 100v to 240v, 50-60Hz selectable, 75 watts maximum. Dimensions: 19 x 12 x 3.5 in (482 x 305 x 89mm) Weight 22lbs (10kg). Be sure to add JRR Shop to your favorites list. & check out our other items. 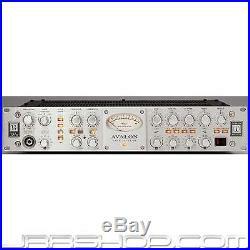 The item "Avalon VT-737SP Mic Pre/EQ/Compressor Channel Strip Free Ship JRR Shop" is in sale since Saturday, March 12, 2016. This item is in the category "Musical Instruments & Gear\Pro Audio Equipment\Preamps & Channel Strips". The seller is "jrr_shop" and is located in Garden Grove, California. This item can be shipped worldwide.